Chief Abiola Ogundokun, an ace politician and veteran journalist, worked in various media organizations before he joined politics fully and served at various levels and offices. 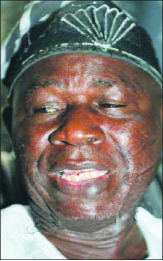 He was the former National Publicity Secretary of the defunct National Party of Nigeria (NPN). In this interview with Bamigbola Gbolagunte, Chief Ogundokun recalled his relationship with the late Military Head of State, General Sani Abacha and late business mogul, Chief Moshood Kasimawo Olawale Abiola, who he described as his close friend. He also recalled how he turned down the ministerial appointment offered him by Abacha. How would you describe your foray into politics and how was your entire political adventure? I have been a politician for quite some years now and it has been very interesting because it has afforded me the opportunity to assist my people. I was at the Constituent Assembly many years ago. I served as National Publicity Secretary of the National Party of Nigeria. I was a leader of the Peoples Democratic Party (PDP) and I contributed significantly to the emergence of Prince Olagunsoye Oyinlola as the governor of Osun State in 2003. I became a politician by the act of God and God really favoured me because I never lost any election in my home town. Even when the late Chief Obafemi Awolowo sponsored a candidate against me, I defeated the person with the help of God and the support of my people. Was restructuring part of your recommendations at the Constituent Assembly of 1977 and what is your personal position on the clamour for restructuring? When we were at the Constituent Assembly, we never thought things will turn out to be like this. Things have really changed in Nigeria. Not many people at the constituent Assembly were disposed to the presidential system of government but later, I have come to discover that presidential system is wasteful. Except the Awolowo’s camp led by late chief Abraham Adesanya, others prefer presidential system then. Today, we have come to discover that presidential system opens way for corruption. However, Nigeria must be restructured if the country will move forward. If restructuring is not done, Nigeria will not move forward. Therefore, it is compulsory to restructure Nigeria. The truth of the matter is that Nigeria needs to be restructured if the country wants to remain together. If this country will be sustained, then there must be restructuring. There is no relationship or family anymore. There is no sense in a situation where a section or an ethnic group will take all viable appointments and use all our common resources. Do you think others will just sit down and watch? Former President Olusegun Obasanjo recently wrote a letter to President Muhammadu Buhari, advising him not to contest in 2019. What is your take on this? Those who are condemning Obasanjo are wasting their time. Obasanjo is a man after God’s own heart. If God has promoted a man and some people are condemning him, they are just wasting their time. Obasanjo is today the president of all former presidents in the world. He was unanimously elected as the leader of all the former presidents in all the nations of the world. So, if this kind of man gives an advice to a president of a country, he should take to the advice. We should look t his past contributions to the country. The man knows what he is doing. At his age, he worked to bag a Ph.D. I expect President Buhari to take the letter in good spirit and call Obasanjo to a round table meeting for discussion, rather than people attacking him. They are only trying to bring out unnecessary debates from the letter, rather than call him and seek for advice from him on what next to do. How comfortable are you with the present situation in the country, being an elder statesman? It is not good to condemn any government outrightly. While criticizing, we must proffer alternative solution. However, the truth is that no reasonable person will be comfortable with the situation in the country. Our leaders who are matured need to sit down and proffer the ways forward. What is your dream for Nigeria? I want a country where there is love. When there is love, there will be unity and when there is unity there will be development. As a prominent Yoruba leader is the state of Yoruba nation pleasant? It is worrisome and very disgusting. A Yoruba leader will say something today and you will see another Yoruba leader condemning what he says tomorrow. This is too bad. We need to work together as members of the same family. However, I am sure that with the emergence of the new Are Ona Kakanfo of Yoruba land, Otunba Gani Adams, there will be development for the Yoruba nation. The young man should however, be wary of those that surround him. He should be well guided and avoid wrong people who may want to mislead him. Gani Adams is an energetic young man who has all it takes to succeed. His emergence is a blessing to the Yoruba race, but politicians must not corrupt him with their dirty stole wealth. He should avoid politicians in all that he does and avoid dirty politics for him to succeed. Between PDP and APC, which political party has good ideologies which are beneficial to the masses? The two political parties have ideologies. The two parties have their policies but the application of the policies is the most important thing. The basic thing is to implement policies of the parties and having good persons in position to implement the policies. Which of the two parties do you belong to now? I am a father to all of them. I am a father to those in APC and those in PDP. I have given my best to politics but what I get in return is disappointments. I invested in people who later disappointed me. I am now a father. They all come to me and I give them advice. I play my roles as a father to all. I welcome all members of various political parties to my house and give them what they want. What advice do you have for politicians ahead of the 2019 general elections? They must not see the election as a do or die affair. The love of the nation must be above their selfish interests. They should remember that there is no other place for them to go aside Nigeria. I see a very dangerous tomorrow for Nigeria in 2019 if we don’t start to mend fences now. I see a lot of blood shed on the way in 2019. What was your relationship with the late Chief MKO Abiola and General Sani Abacha? MKO Abiola was my very good friend till his last day on earth. We related very closely till he breathed his last. Thank God General Ibrahim Babangida is still alive today. When MKO was doubtful of Babangida’s sincerity as whether he would be allowed to contest, I met him at the Sheraton Hotel where he lodged and together we went to meet Babangida. Babangida promised us that he would not stop MKO Abiola from contesting and Babangida kept his promise. Babangida is a man of his words. When he says something he will keep to his words. We are all good friends, but people capitalised on Abiola’s wealth and they were cheating and deceiving him. God will ask all of them what they did for Abiola. All those who used Abiola to get to where they are and later deceived him will be asked by God. One thing I hate is deception. I don’t deceive people in my life and I will never deceive anyone that comes my way. What of the late General Sani Abacha? Abacha was my very good friend and we related well but I didn’t have anything personal or private with him. I fought for Abacha when we were at the Constitutional Conference and I didn’t take money from Abacha for doing that. Some people are very deceptive, when they were looking for appointments and they couldn’t get, they began to say bad things about Abacha. I am not like that. Thank God Major Al Mustapha is alive. He will confirm that I didn’t take a dime from Abacha. The only time they brought money for me I rejected the money. Dr Olunloyo is alive, please go and ask him, he will tell you that I rejected Abacha’s money. Abacha did not know I was spending my own money when we were at the constitutional conference and when he knew he sent #500,000 to me through Al Mustapha but I rejected it. Every week I took 10 people to Abacha to wine and dine together with him at the villa. I was doing things according to the dictates of my conscience. Olunloyo was there with me when Al’Mustapha brought the money and I asked them to share the money among Yoruba leaders. I still have the documents of how the money was shared because they all signed for it. When I took some prominent Nigerians to conference across the world, they all collected money. Some of them were prof. Tam David West and Tony Aneinih among others. Also, Abacha wanted to compensate me and offered me a ministerial offer, but I rejected it. I make bold to say it today that I Abiola Ogundokun rejected ministerial offer. If anybody claims to be more loyal or patriotic than Ogundokun, tell that person to meet with me. You once had issues with former Osun State Governor, Prince Olagunsoye Oyinlola, how is your relationship now? Oyinlola offended me and his whole family came to plead with me and I have forgiven him. Oyinlola could say anything against me because he is looking for position and I am not looking for any position. I have never sought for any position in my life. I know how he became the Governor and he also knows. Even, the idiots on the streets knew that Ogundokun was instrumental to the emergence of Oyinlola as Governor of Osun State. Al the campaign posters he used were printed by me. All the branded clothes and caps he used for campaign were made by me. I made billboards for him and many other things. I spent millions for Oyinlola, but thank God because God is helping me. Oyinlola and I have one common friend and that is Obasanjo. I believe in Obasanjo very strongly. When Obasanjo was in government, I was not close to him but today we are very close. My friend, Chief Afe Babalola reported to Obasanjo that Oyinlola offended me and Obasanjo invited us to his place and despite his cordial relationship with Oyinlola he lambasted him and asked Oyinlola to prostrate for me. Later, Oyinlola brought his family members and political associates to me to apologize. So, I have forgiven Oyinlola. Why are you not part of the Afenifere? They started the Afenifere with the spirit of Awoism and I don’t belong to the Awolowo school of politics. I have never been part of any political party that is believed to be founded by Awolowo. But, I am a member of the Yoruba Unity Forum and we meet in Awolowo’s residence monthly. Awolowo once invited me to his party but for personal reasons, I declined. I love Awolowo as a person but I didn’t belong to his political party. The family of Awolowo has been used and cheated but God is helping them. As a prominent son of Iwo, what roles are you playing on the alleged scuffle between the Ooni of Ife and Oluwo of Iwo? The Oluwo should be told the truth and he should stop being dictatorial. The Oluwo should not rubbish history and he should give respect to the Ooni of Ife as the symbol of the Yoruba race.The Oluwo should know that age is catching on him and have a change of attitude. He should stop being jealous. He should change from his past and stop believing that whatever he wants must be gotten at all costs. He should know that he cannot be Ooni of Ife. He should move closer to Ooni for him to enjoy the respect he enjoys. Ife people and the whole Yoruba people love Ooni, he should do what Ooni is doing for his own people to love him. He should stop being disrespectful.